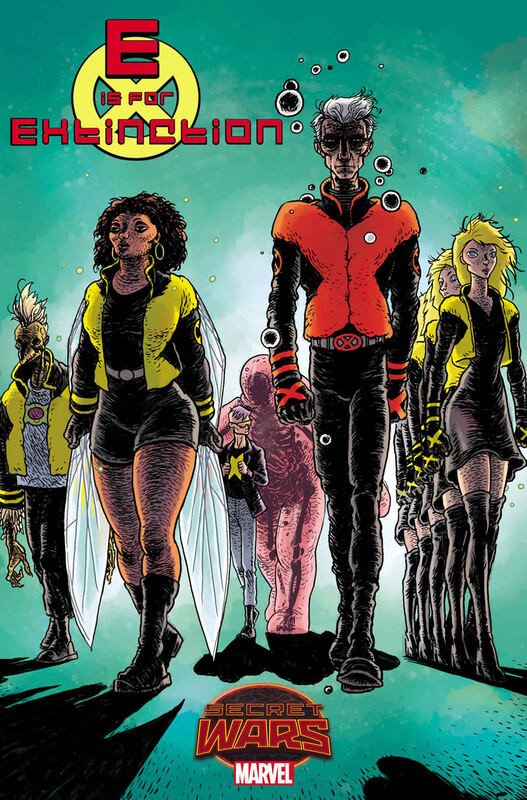 Your New Look at E IS FOR EXTINCTION #1! New York, NY—May 29th, 2015— Ask yourself – what happens in a world where mutants prove once and for all they really are Homo SUPERIOR? Today, Marvel is pleased to present your new look at E IS FOR EXTINCTION #1, an explosive Secret Wars series debuting this June! Be there as creators Chris Burnham and Ramon Villalobos return you to one of the most groundbreaking and beloved X-Men eras of all time on the surface of Battleworld! What happens to the X-Men when they no longer fight for a world that hates and fears them, but for a world that wants to be them? More importantly – what is Magneto doing running the Xavier institute?! The world may be a utopia for mutants, but there are still those who seek to crush Magneto and his team of New X-Men. Together they’ll face down the villainous U-Men, and even….the original X-Men?! The sparks will fly this June, so strap in and prepare for a thrill ride as Burnham and Villalobos flip the X-Men on their heads in E IS FOR EXTINCTION #1!